I had always wanted to try dropping down and began experimenting as early as 1999. I was having a difficult time getting Carlos Delegado out I would drop my arm angle against him once in a while and had some success with it. I never really made a full commitment to it though until 2011. It was at that point that I realized my career from my regular arm angle was over and that this was my best option to try and extend it. The biggest advantage for me was most notably against left-handed hitters. That is an angle that they just don't see very often and as a left-handed pitcher they had a difficult time staying in on my pitches. Specifically the breaking ball that would sweep at a completely different angle that they were not used to seeing. A lot of guys would bail out. No. Had I not decided to try and drop down in 2011 my career would have ended then. When the time is right make a full commitment to it. I wish I had started earlier. My work as a sidearmer was pretty good but I just ran out of time and I never could completely get it developed. It can be frustrating at times, there is an adjustment there but once you make the commitment you need to be patient until you get it. There are lots of different theories on which is the best way to throw SideArm. You really have to surround yourself with good coaches ask a lot of questions and find what works for you. Keeping my hands close to my body throughout my delivery was a big help for me and kept me consistent. And really being conscience of my hand angle was also extremely important. Sometimes as a side armer you want to see more velocity but you come out of your mechanics to do it, even the slightest change in hand angle can really flatten the baseball out and at that point become very hittable. Before I dropped my arm angle I threw a four and two seam fastball, forkball type changeup, a cutter, and a knuckle curve ball. After dropping my arm angle I had to remove the cutter and adjust the grip on my changeup. I threw mostly 2 seam fastballs and my curveball to left-handed hitters. My changeup actually became very good which helped me to neutralize right-handed hitters. As a sidearmer it can be very effective if you have a good changeup when facing opposite hitters. I basically worked lefties middle – in with my two seam fastball and ran my curveball away. I would also throw my curveball front door sometimes to them. For right-handed hitters I would throw mostly changeups and two seam fastball's away. I could also bury my curveball down and in and also try to catch the outside corner with it away. 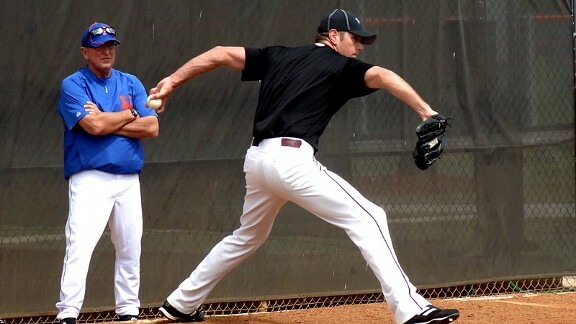 I really had so much fun pitching from that arm angle. Seeing lefties take very bad swings on a breaking ball was fun but also seeing righties struggle with a 80 mile-per-hour changeup was fun too.